I'm stuck with 4 chests that won't reset, Frostgorge, Lornar's, Timberline, and Mt. Malestrom. Just finished my second round yesterday and went to start on the third and the three chests I checked were all open already. I didn't see any point in wasting my time going to the other seven. The achievement appears normal in my Hero Panel, but no dice. I guess the good thing is we can keep collecting keys and when it's fixed, there's nothing keeping us from opening as many chests as we have keys for. That's some, maybe small, consolation. I haven't logged in in 3 days and yet all the chests are stuck in open positions. Double check your Achievement list - you have to finish all chests on the list before the list resets. Just to repeat what was said above: ANet support have confirmed the bug is known, and a fix is being worked on. However, an ANET dev hasn't popped in to say the same thing. I think that's why folks are still posting on it. Until we, as a group, hear it from the actual devs we reserve the right to post about it. And then even after. Sure. You can do anything you please, once you have this information. Enjoy. Won't, of course, make a lick of difference, and like most bugs, you won't actually get a developer response, but hey, you do you. It is nice to hear from a random person in this topic that ArenaNet support has confirmed that the bug is known. It would be nicer if that support person had asked Gaile to react to this topic so we have a post from a ArenaNet employee with a ArenaNet logo next to it. I have no reason not to believe you, but I would really like that the communication between ArenaNet and me as a player doesn't go through a random other player. I don't expect ArenaNet to react to every bug report, but they better react if the posts of that bug clutter the first page of the bug forum, even more if they know it is a bug. It would also stop nonsense like "I posted the solution on page 2, it is on a 10 day cool down, you just have to wait" that has been refuted by many posts. That said, I don't expect a reaction during the weekend. I hope we will see a reaction on Monday after Gaile had the time to consult her colleagues. If there is no known ETA for a fix just an acknowledgement of the bug would help a lot. All my accounts have this bug now, stuck either on 5/10 or 4/10. Oddly, although this thread was created on 27 May this bug has only just hit me today, I run this much the same time every day so daily reset would have happened before today's attempt. More oddly, the daily 'kill 10 krait' DID reset as I was able to get another one, so it's a problem with the chest alone. I'm currently 8/10 on my 4th set. Again, no chest today .. but I did get another key ftom 10 krait next to the chest, so I now have 2 of them .. but I just noted I have exactly 100 +10s in my inventory, wonder if there's some cap at 100 which is preventing chest spawns for me? I've hit the same issue on my 3rd run, 8 out of 10 are not available. I will ss if I hit the same issue on my alt accounts. That's two accounts which have the issue now. This didn't work for me, BUT I have a guildie who said she was bugged and she went back to the LA npc and went back through the dialogue about the chests and it reset them for her. Again, this didn't work for me but with so many ppl experiencing the problem it seemed worth mentioning if it might help some ppl . . . Someone has already answered correctly on page 2 or 3? After i followed it I found it to be correct. Each chest has a 10 day cool down. So just make sure to do your rounds according to the map rotation you did the first round and it will all be good. Wrong. I did my chests 12 days from now and they still are opened. It's a bug, not customer fault. I think you can only re-open a chest if you've started a new cycle of the master diver achievement. I thought this too at first but then I completed a cycle and I couldnt open any more anywhere. It is indeed buggy. In another thread someone posted their response from ANet support, who said that the developers are aware of the issue, and are working out how to fix it at the moment. If this it true then its bugged, I completed a cycle and went the following day to start it fresh and there was 7 of the 10 I could not open/interact with. Going for my 6th chest no go. All chests checked and 'open'. I can't handle this, I'm getting my bless refund, even though I didnt purchase it. I ended up checking all of the chests twice, NONE were available, all showed already open. 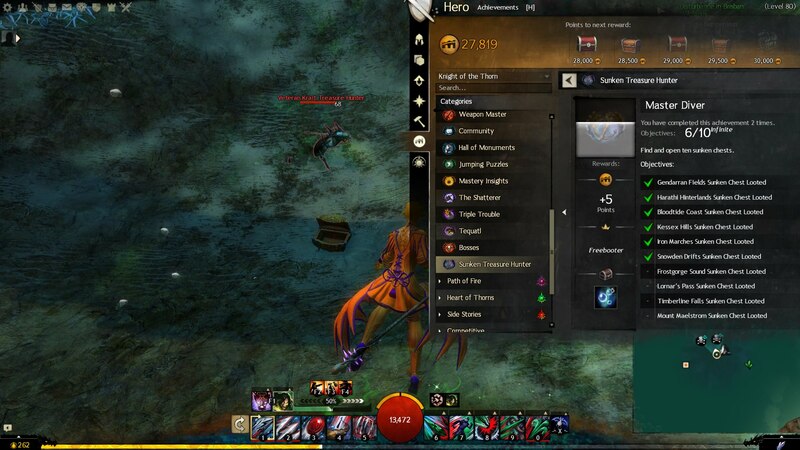 Went to Herathi 3rd time to get screenshot for in-game report showing the open chest in the middle and the hero screen with the master diver achievement open to show Herathi chest had not been opened this round. I have been having issue intermittently but was always able to find one that would open until today. That's the feature described by the people posting after me. Haven't encountered it myself so far. Please be aware that there are no bugs in this game, only features. Lol do I detect some sarcasm here? I'm guessing it's actually "chests don't reset after the 22 May patch", and of course for anyone with a daily routine (one per day) who started when the chests were first released, that means "partway through the third cycle". The mythical keys that "drop from mobs"(1) would accelerate that, of course. (1) Sorry, but until it actually happens on one of my characters, I'm going to treat it as a myth. I reported this bug via ticket and got official reply that the issue have been since the last update. There is nothing they can do atm but they are investigating and the appriopriate team already working on the solution and we should keep our eyes peeled on the forums for the fix or any news from them. well, sure there is something they could do about it. They could have reverted the change that caused this bug. We now what that change war: making opening the chests interruptible. THAT would be the right thing to do. Revert it, fix it, then reintroduce it. Sadly, knowing anet, this bug will be with us for the next 4 weeks. Because it does not affect gemstore items. Look in the bug section it's an official bug, and yes I'm done I even have the title. Nah, that'd be conspiracy theory, there. I got two mob-dropped keys, the first from fighting Chak in Tangled Depths, and I think one during a battle with Dredge. Finished Dive master twice so far. gathering 10 keys then going for a full run of chests each time. Today I got the next 10 keys together and found the sunken chests already opened/not resetted. I just checked the Known Issues tracker and it's not in there. Can you point me to where it is? It would be nice to get some info from the devs on this, at least a "hey we are working on it. I have been doing them in order and after my 2nd achievement chest all sunken chests appear open. I was three chests into my third go-round yesterday when this happened to me - I tried all the chests, but they were all open and nameless. So I guess I'm just stacking the keys until the devs sort this out. Glad to see it's not just me! We all know it's a bug and we are in the bug section so it's official or will be once the devs put their noses in here. As for my case I found the specifics of it I've got 10/10 chests done the achievement gave me the reward and title Freebooter, even with the achievement given it claims 9/10 with all 10 chest done and all the chests in game are not resetting and stuck on open position. Here's a pic as abnormal as may be. As you can see on the pic all 10 are done but the achievement refuses to show 10/10 it show 9/10 and you can also see on the left I got the title. More update looking at the pic shows Timberline falls completed and looking at the list where the markers are it shows undone. More update and now I wonder if it's really bugged, this is a repeat achievement on the main page it show all done with 10/10 chest and say 9/10 complete but if you go on the markers page is where it shows the ones not done for your second or third pass at it. Starting my third pass at them to confirm this after reset tonight. My markers are 0/10 now see you tonight. Since i had 2 keys I tried it right away and inside of 5 minutes I got 2 chest to open and give me loot, confirming after all this is not bugged people are simply misunderstanding how the achievement works. It's works based on markers alone. Gendarrasn for example you unlock it now it will not open tomorrow it will open on your next pass of the full list. @Hybarf Tics.2048 if you have time, please also report via /bug (in-game) or a support ticket. I'm sure this thread will get looked at, but those two methods give them additional details (especially /bug). The "know issue tracker" is misnamed — it's never any more than a list of bugs of interest, curated by the QA team. There are many bugs that never make the list, it's sometimes not updated before some highly-visible bugs are fixed, and it has (in the past) gone weeks & weeks without updates. In short: it's useful to know when a bug is on the list; it's not very meaningful when it isn't. We can also call something a "known bug" when any from ANet comments about it, using language such as "hmmn, that's not how it's supposed to work" etc. Sunken Chest in conclusion after all my testing is not a bug it is a complex achievement yes. Here's the thing it's one key a day only you can accumulate them and open more than one chest as long as those chests are not marked on the list. Once a chest is open it will remain so even after 5pm reset, chests only close once the full 10 markers list is complete. This is where people go wrong they don't check with the marker list they assume the 5PM PST will reset everything. It is the marker list that resets it all not the server time. You're wrong. I checked with my marker list (I also have a methodical approach to repeating the achievement, working up from the bottom), and the four that I have "unchecked" are still allegedly open when I visit them. I last visited them before the end of my current achievement cycle, and I've never had a mob-dropped key, so it's one chest a day for me. Same here, I'm on my second rotation at 4/10. Haven't played for 2 days, loged in this evening, got a key, checked which chests are still missing, went to Harathi Hinterlands.... Chest was visible but without any text (the yellow ones showing interactable objects). Moved on to Frostgorge- that chest was usable as it should be. So sure, @Hybarf Tics.2048 is probably correct that there are multiple cooldowns involved, not all of which expire on reset and some of which won't start until the Master Diver achievement is completed. However, not everyone waiting past that time is able to open any of the chests. And, even if that hypothesis was correct, it's unintuitive and confusing. There are no other collections, chests, achievements that were intended to work like that. Just to add my info. I am having the same problem. I finished the achievement twice. I finished 3 on the third round. Since then, none of the chests show as available. All chests show as open with no text above them when I swim up to them. Checking the achievement shows the 3 chests that I got in the third round with a checkmark. All others have no checkmark but are listed as looted. I hope this gets fixed soon. Until then I am collecting keys and waiting. They do have a liaison/communication team lead who could have responded and it may have helped with this specific concern of no communication. Don't need an actual dev to chime in, just some communication. I do know, however, that until I received a random DROP of one of the keys (which until then had never happened before), I could literally open the same chest multiple times if one had a key for it. After that, all of the chests went on the AWOL list for interacting, open or not. I had accomplished the achievement twice, and was working on the third one by the time that happened. I think that if you have had a random key drop, and used it, that causes the bug (why, I have no clue), but I see other people interacting with each of them, and can't do it myself with or without a key (when it tells you you need a key). I have used about 8 characters to check to see if it's character-related as well, and none of them can "see" the label. So it appears to be account-based, and may have something to do with a bug brought on by a random key drop. Hope that helps track this down, because while I've been able to do the daily to get the keys, I've not been able to open a chest for almost a week. So this is a dev issue from the sound of it. Hopefully one of them will see the potential that somehow the random key drops may be part of it (anyone else with this problem get a random key?) and deal with it sometime in the near future. As long as the keys will work once the bug is fixed, and I can keep getting the keys, I'm okay with it, but since I maxed out on daily achieves, I'd really like a simpler way to get them like this than taking a 4 hour re-run of stories for 1 achievement point or something (which is about my only other option). Throwing my 2 cents in: On the third pass through Master Diver. Stuck at 7/10 for two days. Ran a repair on the client with no change. Bugged chests are in Bloodtide Coast, Kessex Hills and Gendaran Fields. Checked two of the other chests (Harathi Hinterlands and Frostgorge Sound) just to see if they were working and they were not. I guess I'll just keep collecting keys until they fix it. All I have is Mount Maelstrom's chest to do the next set and its open already. Has been for days. I have the same issue with the chest in Snowden Drifts .. it shows 9 out of 10 opened with the Snowden Drifts one left but that chest has not reset from last time. This has gone on for days. It's been ten days since I last did this repeatable achievement. Now that I have acquired enough keys again, I was going to do the tour once more - but it's still bugged. All the chests I checked appeared as "opened" to me, hence could not be interacted with. I'm astonished that - since it's relatively new content - there has not been any official statement on behalf of this issue yet.